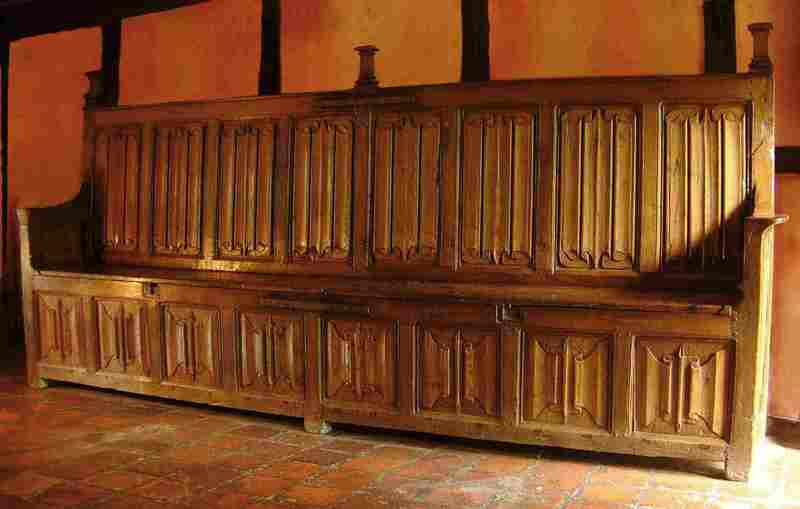 EARLY SIXTEENTH CENTURY STYLE SETTLE, measuring 10’8” in length x 4’10” in height. Handmade entirely from ancient re-claimed oak and of lovely mellow colour, this imposing example admirably demonstrates how good replicas can solve the problems of finding an original in both the required size and desired style. Although, surprisingly, there are quite a number of early settles in existence, mainly in the form of church pews, equally unsurprisingly, very few appear on the market. To find an example of this age, which fits all the criteria for size (including seat height), style, condition and proportions for the intended room, would probably take a lifetime. If you were lucky enough to find one, the likely cost from a good early oak specialist could be well in excess of £50,000. The example illustrated here, we believe, is as authentic as it is possible to get, right down to the smallest detail, and was built at a fraction of this figure.